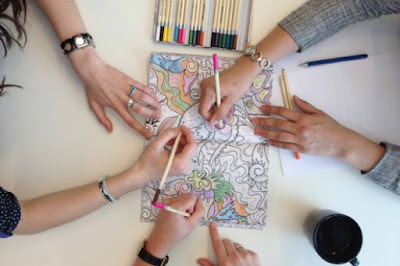 Gaines, on Brains: What Explains the Allure of Adult Coloring Books? What Explains the Allure of Adult Coloring Books? A few months ago, I caved: I bought myself a coloring book. And maybe you did, too, or perhaps you received one as a gift for the holidays. According to a recent Fortune article, adult coloring books are one of the biggest contributors to this year’s boost in print-book sales. With over 11,000 search results total, five of Amazon’s current top 15 best-selling books are coloring books. A few nights a week, I look forward to curling up on the couch with my ever-growing collection of colored pencils, tuning in to the latest episode of Serial, and scribbling away at mandalas and Harry Potters — but I still find the trend strange. I’ve always had a penchant for making new things from scratch — painting, knitting, writing, drawing, baking. But with my coloring book, I’m not really creating anything. The designs are already on the page — I’m just filling in the white spots. And yet the activity is just as soothing to my mind as my more traditionally “creative” hobbies. So what is the psychological draw of a task that feels creative, but doesn’t actually involve creating anything new? Read the rest of this at New York Magazine's Science of Us here.